Mitochondria are known as the powerhouses of our cells due to their high energy generating capacity in the form of adenine triphosphate(ATP). In fact, 90% of the ATP generated in our body is made in the mitochondria via the Krebs cycle and electron transport chain. Cell types vary in their number of mitochondria, typically based on the amount of energy the tissue that the cell belongs to uses. For example, cells in highly metabolic tissues like muscle have mitochondrial numbers in the thousands. Red blood cells, on the other hand, contain none. Few people realize the extraordinary demand we have for energy. People just kind of think that things like hormone/enzyme synthesis and secretion, detoxification, muscle relaxation, tissue breakdown and synthesis, thinking, and breathing just happen. We need ATP to do all of these things. To get an idea of how much energy we use under the hood, 20% of the ATP a cell uses simply regulates the balance between sodium and potassium ions inside our cells. To give you an idea of what that is effectively doing, it’s setting resting potential, meaning 20% of our energy is devoted to making sure nothing happens. But we shouldn’t just view our mitochondria as producers of energy, They do a lot more for us than that, as you’ll shortly see. Mitochondria do far more than just provide energy. In fact, they carry out a large number of tasks that help regulate functions in cells independent of ATP production. Oddly enough, cells that don’t contain mitochondria, such as the aforementioned red blood cells, also lack a nucleus. Critical steps in processes that regulate gene regulation such as DNA methylation and histone acetylation go through the mitochondria, so you generally need both for that to happen. People often make a big deal about their MTHFR status without fully understanding the concept. You can take methylfolate until you’re blue in the face, proper methylation function and flow is absolutely dependent on numerous healthy mitochondria. This is because methylation is an interplay between the cytosol and the mitochondria. The processes on the left are methylation related reactions housed in the cytosol and those on the right are in the mitochondria. 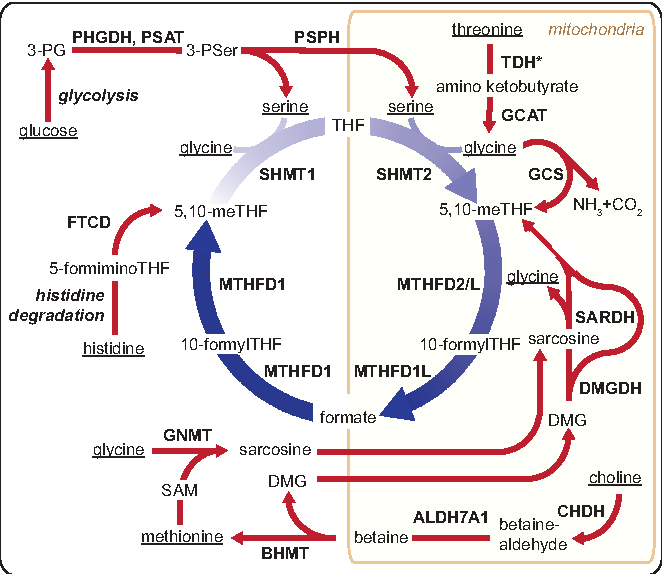 Alpha ketoglutarate and formate are 2 important mitochondrial molecules essential to methylation. Additionally, choline needs to be converted to betaine to donate its methyl group and this happens in the mitochondria. Thus, in times of low folate, low mitochondrial number will reduce the ability of choline to provide methyl groups in place of folate. Choline cycle aside, fewer mitochondria means fewer methyl groups. You can’t separate these processes. In fact, my personal opinion is that reduced mitochondrial content and increased mitochondrial dysfunction are likely the reason that health issues associated with the folate and methylation cycles often don’t arise until much later in life. As we get older, more sedentary, and energy balance is tipped in favor of overconsumption, redox balance favors fewer mitochondria and those that stick around are dysfunctional. That’s certainly not a recipe for health or longevity. Note: Since I finished this blog article there’s a fantastic study showing how gene regulation is a coordinated dance between the nucleus and mitochondria. There’s even a cool video breaking down the process. The researchers found a protein encoded by mtDNA that translocates to the nucleus during nutrient deprivation that promotes stress resistance via upregulation of antioxidant defenses. Yet another reason to build up those mitochondria! Additionally, mitochondria are responsible for synthesizing steroid hormones such as cortisol and estrogen. Since these hormones modulate mitochondrial function, they likely act as signaling molecules communicating things like nutrient status, nutrient demand, fat status, and stress between separate cells and organ systems. For example, the pituitary gland secretes adrenocorticotropic hormone(ACTH) to stimulate the adrenal gland to produce cortisol. Since cortisol synthesis requires mitochondria, the adrenal gland has a rich supply. During the process of steroidogenesis, the mitochondria in the adrenal gland, in coordination with the smooth endoplasmic reticulum, convert cholesterol in to cortisol and releases it in to the circulation. The cortisol is then distributed throughout the body by the blood where it can act on mitochondria in cells from other organs and tissues.. This is where it gets interesting. When cortisol binds to the glucocorticoid receptor on any cell in the body, it translocates to the mitochondria and modulates mitochondrial behavior. At physiological levels, cortisol likely increases energy production and reduces reactive oxygen species. Over the long term or at supraphysiological doses, it likely has the opposite effect. So, in a sense, steroid hormones function to allow mitochondria in different tissues to communicate information to one another, streamlining physiology and promoting health. Based on recent evidence, the sleep hormone melatonin also appears to function as a way for mitochondria in cells throughout the body to communicate with one another. Mitochondria synthesize melatonin in the pineal gland and secrete it during the night to relay time of day information to cells throughout the body. Much of this signaling involves regulating mitochondrial dynamics which promotes an ideal balance of miotchondrial biogenesis(creation) to mitophagy(destruction). Mitochondria also perform a number of other important functions including programmed cell death, calcium signaling, and inter- and intracellular signaling via reactive oxygen species production. Simply put, your health is your mitochondria. If you aren’t aware of where mitochondria come from, the current understanding is that they are of bacterial origin. Many moons ago, a fledgling bacteria joined up with a eukaryotic cell, providing energy to the cell in exchange for safe harbor. Over time, this friendship flourished and blossomed in to complex life. We’re fairly sure of this relationship as mitochondria have their own circular DNA(mtDNA), which is a characteristic of bacterial DNA. As mentioned previously, most of your cells have many mitochondria. The early understanding of mitochondria was that they each simply functioned autonomously from one another to produce energy and partake in the other previously mentioned functions. However, we now know that mitochondria within a cell can change shape and form networks to optimize function. During the process of fusion, mitochondria form large networks that optimize mitochondrial function. Fusion promotes repair of damaged mitochondria and allows mitochondria with different defects in mtDNA to work together to efficiently produce energy and reduce reactive oxygen species by complementing one another. This is important because radical oxygen species often dictate life or death of a cell. During the process of fission, mitochondria are separated from one another to produce daughter cells and pinch off defective mitochondria so that they can be marked for termination in a process called mitophagy. Fission also allows mitochondria to break off and spread out within a cell to interact with other organelles. The nucleus can’t have all the fun. Neither one of these processes is more important than the other, both are necessary for proper mitochondrial function. They, in essence, complement each other to make sure we have a large pool of healthy mitochondria that can work together to provide all of the services mitochondria provide to our cells. So what dictates mitochondrial dynamics? Energetic stress and the circadian clock. Mitochondrial fusion occurs when we require a high output of energy from the mitochondria via oxidative phosphorylation, aka the electron transport chain. The mitochondria form a giant network to efficiently provide a large amount of energy. Fasting and exercise are the 2 primary drivers of mitochondrial fusion. If you think about it, this makes sense. When we exercise, the energy demands placed on our cells, particularly our muscle cells, increases. During the initial 2 minutes of exercise, much of our energy demand can be met from stored ATP and the creation of ATP from creatine phosphate and the breakdown of glucose in the cytosol of the cell. But as exercise surpasses the 60 second mark, we become increasingly dependent on energy from oxidative phosphorylation. It’s important to point out that this is cell specific. Your exercising muscle cells are beginning to ramp up energy production via oxidative phosphorylation, but some are better at it than others. This process can use glucose, lactate, fatty acids, and in some cases, amino acids. The fuel is dependent on the muscle cell type because different muscle cell types are better at generating lactate than others and some are better at using oxidative phosphorylation. But the interesting part about exercise is that we generate lactate in the cytosol from glucose when we need energy to be produced quickly but can’t keep up. When you begin generating a lot of lactate by maintaining higher intensity for a prolonged period of time, lactate is kicked out of the cell. This signals other tissues in the body capable of metabolizing lactate to do so. This includes other muscles, the brain, heart, liver, kidney, and gut. And guess where they metabolize it? You got it, in the mitochondria via oxidative phosphorylation. Therefore, exercise that is sufficient enough in intensity and duration to produce lactate generally causes a system-wide increase in mitochondrial fusion. Additionally, lactate is a trigger for mitochondrial biogenesis, the creation of mew mitochondria. Therefore, this type of exercise increases mitochondrial number and quality throughout the body. Over the long term, exercise also causes us to be more resilient in the face of oxidative stress. Whenever we process energy through the electron transport chain in the mitochondria, we produce reactive oxygen species, also called free radicals. As the name suggests, the electron transport chain generates energy by passing around electrons. Reactive oxygen species are simply unstable molecules that are missing an electron, so they try and steal one from somewhere else, quite often a healthy molecule. This causes damage and as this damage accumulates faster than we can fix it, we experience oxidative stress that can lead to mitochondrial dysfunction. This is obviously something we want to avoid, and luckily for us exercise of a healthy intensity and length actually makes us better at repairing oxidative stress by upregulating our antioxidant defense system. It’s important to stress that the appropriate type, amount, and intensity of exercise is dependent on the individual and their current state. These combined effects of exercise make it the go-to method for optimizing mitochondrial health via increased mitochondrial number, enhanced mitochondrial function via mitochondrial fusion, and the disposal of damaged or defective mitochondria through fission and mitophagy. No nutrient, supplement, or pharmaceutical will do this for you. Food consumption is another means by which we can influence the health of our mitochondria. One may mistakenly take from the above section that more energy going through the mitochondria is a good thing. This couldn’t be further from the truth, it’s context dependent. Increasing energy generation via exercise not only improves mitochondrial dynamics in our muscle cells, it causes a system-wide improvement in mitochondria. During this process, a small amount of collateral damage occurs through the generation of reactive oxygen species, but our body responds by increasing antioxidant defense to limit oxidative stress in the mitochondria and make us better at doing so further down the road. Unfortunately, when we just kind of lay around and overeat, we see a similar increase in metabolism and the generation of reactive oxygen species but no improvement in antioxidant defense. So even if we saw improvements in the creation of new mitochondria, we’d be making more than enough reactive oxygen species to damage these new mitochondria, increasing our chances of damaging mtDNA and creating mutant mitochondria. Not ideal. Another important factor here is that in the presence of ample glucose and low energy need, our cells just don’t need to rely on oxidative phosphorylation. Our cells can rely on glycolysis which doesn’t require mitochondria, so the signal isn’t there. This causes us to create lactate but the liver ends up converting it to glucose and releases it back in to the blood, elevating our blood glucose. This means there’s no stimulus for mitochondrial biogenesis or mitochondrial fusion so we don’t get that mitochondrial teamwork we’re looking for. This is probably why we see greater oxidative stress and mitochondrial dysfunction in people with Type 2 diabetes. In a healthy individual, withdrawing food causes a decrease in blood glucose levels and a greater reliance on oxidative phosphorylation. In Type 2 diabetics, blood glucose levels remain elevated, likely because they experience autonomic dysfunction due to damage to the nerves that control the autonomic nervous system. This is an early consequence of elevated blood glucose, even healthy people who experience mildly elevated blood glucose and insulin begin experiencing autonomic dysfunction within 48 hours. Autonomic nervous system function is largely dictated by the circadian clock which brings us to how the circadian clock regulates mitochondrial dynamics. Circadian rhythms govern the physiology of all complex life on the planet, but for simplicity’s sake we’ll just stick to us humans. It’s probably more physiologically correct to have a period of increased blood glucose during the period of the day when we eat. If we are physically active during this period, glucose will be converted in to lactate and metabolized in the mitochondria. During this time, since we’re also being physically active, our antioxidant defense system is ramped up so any collateral damage from processing this glucose and lactate in the mitochondria is minimized. The increase in lactate and glucose metabolism in the mitochondria spurs the generation of large mitochondrial networks and generates more mitochondria. As night falls and our feeding period ends, blood glucose levels drop and we begin metabolizing our body fat and ketones in our mitochondria. While we aren’t being physically active, ketones seem to take over the protective duties that exercise would normally provide. At least in the brain, ketones optimize oxidative phosphorylation in mitochondria and reduce oxidative stress. A study on the ketogenic diet in rats showed the same thing in the liver, but it’s important to point out that a long term ketogenic diet will cause changes to muscle mitochondria that aren’t exactly ideal. I’m not big on the ketogenic diet, I recommend time-restricted eating as this allows people to be more metabolically flexible. You will absolutely not tolerate carbohydrates on a ketogenic diet, so you’re kind of forced to stick with it. The other reason I am more in to time-restricted eating is that the processes of mitochondrial fusion/fission are under circadian control. This makes sense, you don’t want to eliminate mitochondria while you’re using them during times of high energy demand and utilization. Complementation during fusion can limit reactive oxygen species generation and promote adequate energy supply. Once energy demands drop and energy flow through the mitochondria decreases, this seems to be the best time to break off defective mitochondria via fission and destroy them via mitophagy. I don’t think you’d be surprised if I told you that the modern human lifestyle is not ideal for healthy, plentiful mitochondria. Mitochondria appear to function best in the above environment. High energy demand through physical activity, low energy supply due to reduced calorie availability, and a circadian rhythm that promotes cycles of use and disuse. But modern society seems to be going in the opposite direction, with low energy demand coupled with high energy supply and rampant circadian dirsuption. The result: lower mitochondrial number, greater mitochondrial dysfunction, and a greater rate of aging. This makes perfect sense when we look at all of the things that mitochondria do, particularly with regard to methylation. The epigenetic clock, which functions as a way to predict biological age, measures age-related changes in DNA methylation at specific sites in the genome. The genes most associated with biological age become hypomethylated as we get older, and I wonder if it’s not a coincidence that we see increased mitochondrial dysfunction and decreased mitochondrial number with increasing biological age. Interestingly, calorie restriction delays these changes in mice and monkeys indicating that energetic stress to mitochondria may play a role in delaying aging. When we take a gander at the Blue Zones, people there experience a much slower rate of aging than people in modern society. They also happen to practice calorie restriction by necessity and are very physically active. While there’s no way of knowing for certain, an attractive hypothesis is that their lifestyle maintains a greater pool of efficient mitochondria through reduced energy supply and increased energy demand. This maintains a healthy pool of mitochondrial to fulfill the many physiological roles we depend on from our inner bacteria, including DNA methylation and regulating the epigenetic clock. This environment, very much like the one humans evolved under for most of our time on the planet, may promote proper mitochondrial signaling. And as a result, a much healthier, happier, and robust human being. Mitochondria are more than just lone wolf cellular powerhouses that provide our cells with energy in exchange for safe harbor. They’re dynamic participants in processes critical to complex life ranging from epigenetic regulation, cellular repair, termination of defective cells, and, yeah, they provide our cells with most of their energy too. One of the best ways to promote optimal health is to maintain a large population of healthy mitochondria that remain coupled with our circadian clocks to balance removal of defective mitochondria with the creation of new healthy ones. In order for this to work properly, we need to be chronically exposed to energetic stress in the form of physical activity AND calorie restriction or time-restricted feeding. Coupled with the feeding/fasting cycle and physical activity, proper exposure to light at the right times of day helps relay information to our mitochondria via melatonin and cortisol output. This sends the correct signals to our mitochondria who communicate with one another by synthesizing hormones and using them to communicate with one another throughout the body. The modern human lifestyle puts us at odds with the demands previously placed on our mitochondria during much of our evolution. Energetic stress coupled with proper circadian timing have the potential to right the ship. It’s probably no coincidence that people in Blue Zones live longer and maintain function over a longer period of time than people living a modern lifestyle. They may be speaking the only language our mitochondria know how to speak.